Sonoff, a (smart) wifi switch, which you can buy for appr. 6 dollars on several Chinese websites. Sonoff is a cost effective smart home solution designed and produced by ITEAD. 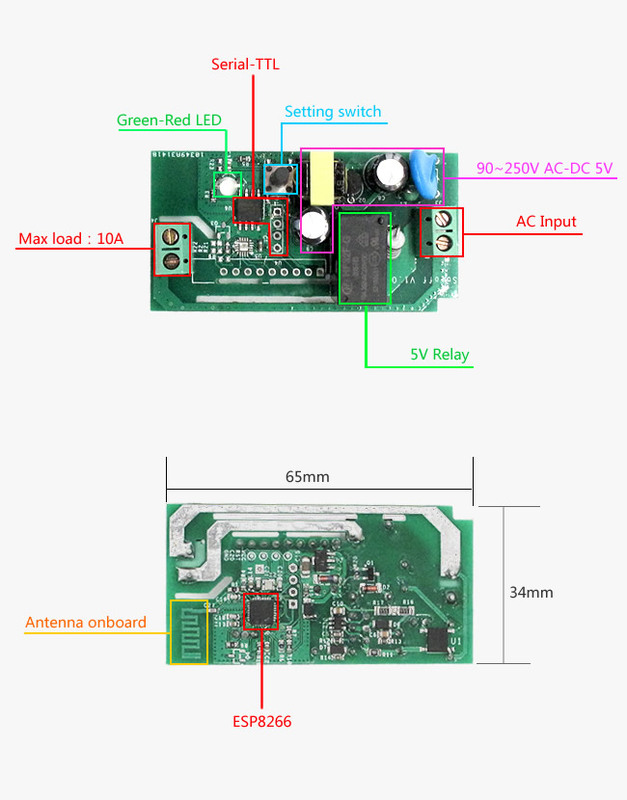 It’s a ESP8266 based WiFi wireless switch that can connect to appliance of different types and brands. Do a search on Youtube like “sonoff esp easy” and you will find many tutorials how to accomplish this. USB-TTL converter ( CP2102 serial converter chip) 6 pins TTL connector for 3,3V, RST,TXD, RXD, GND and 5V. I’ve connected the USB-TTL converter – without any wires connected- once to my computer, so I was sure the device is recognised correctly, and a COM-port was visible in device manager. In the most online tutorials the jumperwires are in different order, but in my case the purple and yellow are switched, (This is explaned there too. If flashing the firmware is not working, you have to switch the RX/TX wires, in my case the yellow and purple wires). Be sure the 4 wires are connected correctly between the 2 devices. While holding down the button on the Sonoff (long black pin next to led), connect the USB to your computer. Once it’s connected, you can release the Sonoff button. This bring the Sonoff in programming mode. The prompt, will ask 3 questions, which has to be entered, and confirmed with ENTER. Now the firmware flash procedure will start automatically. If you receive “connect failed” messages, close the prompt window. Switch the TX/RX wires on the USB-TTL converter. 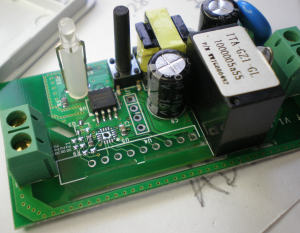 Leave the 3.3V and GND untouched, so the Sonoff will stay in programming mode. Once the 2 wires are switched, start the “flash.cmd” again and enter the above values again. Finally, “flush is complete” and the command screen can be closed to press any key. The ESP easy firmware is now successfully flashed on the Sonoff. Disconnect all jumperwires from the Sonogg and connect it to 230V. The Sonoff will create it’s own wifi network. Use your phone, tablet, wifi connection to connect to the “esp_0” network. In some cases the new wifi hotspot is not visible, a restart of the Sonoff the device is required. In my case, it’s a matter of reconnecting the USB-TTL device to the pc. Start your browser on this device and go to a random webpage. Normally it will go directly to the start page of the ESP easy configuration. if not, go to http://192.168.4.1, which is the default page. Here the available wifi networks are displayed and you have to select your wifi network and add your own wifi password. Open the ip address of the Sonoff in your web browser. On the same website as were you have downloaded the firmware (http://www.letscontrolit.com/wiki/index.php/ESPEasy), you have a tuturial what you can do in it’s setup, but the tutorial below will explain the minimum but necessary configuration. In the next steps, the basic necessary steps are showed, and how to switch the Sonoff via http commands. Go to tab “Devices”, you will notice all Tasks are empty. Enter the details below as displayed. Note: Name can be changed into any name, but you need this name later in a script. When Ready, Press Submit and Close. The settings are saved now. To use tab “Rules”, we need to first activate this option. Click at the bottom of the page on “Submit”. You will notice that the tab “Rules” will become visible. Go to tab “Rules”. Here we will define a script, so we can call it via a http command. Note: On “name”, this will be called as Event name in the http command. “switchsonoff1” is the name of the script, which will be called via the http command below. “relais” is the name of the switch, which is used in the Devices tab, at the earlier created Task1. You can have mutiple scripts in the same Rules tab. Select in tab “Hardware” at “Wifi Status Led” from the dropdown menu the option “GPIO-13”. “state” is the value name in the created task. When pressing the button on the Sonoff, the internal relais will be controlled, including the led. Example: When the light is switched on (=GPIO 12), the led(=GPIO13) will be switched on too (green color). Could you tell me where to download the sources? Maybe switch to Shelly1 ?? Just flash Tasmota with Arduino and all works fine, in Domoticz as well. 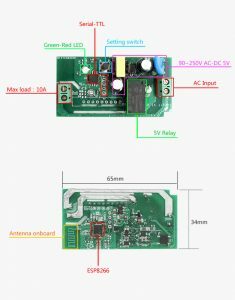 The Sonoff Basic from the Chinese company iTead is a cheap module: on Chinese websites like Banggood.com and AliExpress.com you can find them for around five euros. By default you use them with an app from iTead, but by installing new firmware on the microcontroller you make the device open for your own systems. That is what we are going to do in this DIY. The device appears to be based on an ESP8266 microcontroller and we know what to do with it. In order to flash the firmware on the Sonoff Basic, we work with the Arduino IDE, which supports the ESP8266 in addition to the Arduino microcontrollers. To get started with the ESP8266 in the Arduino IDE, you first need to enable the support. To do this, open the File / Preferences menu and enter the url http://arduino.esp8266.com/stable/package_esp8266com_index.json in Additional Board Manage URLs. Confirm with OK at the bottom and restart the Arduino IDE. Then open the Board Management in the Tools / Board menu. Search there on esp and install esp8266. In the Tools / Board: for Generic ESP8266 Module menu, set the Flash Mode to DOUT and the Flash Size to 1M (64K SPIFFS) (also via the Tools menu). Then download the zip file from GitHub with the source code of the Tasmota firmware (https://github.com/arendst/sonoff-tasmota/releases) and extract it. Copy the sonoff directory to the Arduino directory in your home directory and the contents of the lib directory to the Arduino \ libraries directory. Open the sonoff.ino file in the Arduino \ sonoff directory in the Arduino IDE and click the check mark at the top left to verify that the code compiles correctly. If so, then it’s time to prepare the hardware! Open the housing of the Sonoff module by pushing a screwdriver in the split next to the green screw terminal until the plate at the bottom comes loose. That way you break the warranty label (at least, we suspect that it is, something is printed on it). In the middle, right next to the 470 μF capacitor, you see five holes in the PCB (see image ## left / right / bottom / top ##). You do not use the hole furthest from the button. The other four are (from closest to the button to further from the button) 3.3 V, RX, TX and GND. Make sure that your USB-to-TTL cable puts 3.3 volts on the pins, not only for the I / O pins, but also for the voltage pin. On some usb-to-ttl break-out boards you can set this with a jumper on the right pins. Some cables have four colored wires: red = 3.3 V, black = GND, white = RX and green = TX. At a break-out sign you look at the indications at the pins. Now connect the pins as shown in the table opposite. To connect the pins reliably, you have to solder a header on the holes in the circuit board of the Sonoff Basic WiFi switch. If you do not want to make that effort, try to push the jumperwires of the usb-to-ttl cable slightly diagonally into the holes of the Sonoff Basic so that they make contact. But that did not work reliably enough for us, so we took the trouble to solder the header on the Sonoff Basic. replace “sonoff” with the name of your project (and the quotes will stay there). Give each Sonoff module in your house a unique name. You define your Wi-Fi network in STA_SSID1 and your Wi-Fi password in STA_PASS1. You can also define a second Wi-Fi network. These are the most important amendments. The other you can always change later. Save your changes, press (and hold) the button on the Sonoff PCB and press the wires on the PCB. Then connect the usb-to-ttl cable to your computer and release the pressed button after a few seconds. The Sonoff sign is now in flash mode. Check the Arduino IDE for the correct serial port. You can see this at the bottom right or in the Tools / Port menu. If necessary, change the port in that menu. Finally click on the arrow next to the check mark at the top left to start flashing. If you have not soldered a pinheader, keep the wires on the Sonoff PCB all the time. If the firmware is correctly flashed, you will see 100% on the bottom of the Arduino IDE console and the green LED on the Sonoff module will flash once. You can now remove the usb-to-ttl cable. If LED keeps blinking, go to IP address of just flashed Sonoff, configuration, configure other and uncheck MQTT enable. 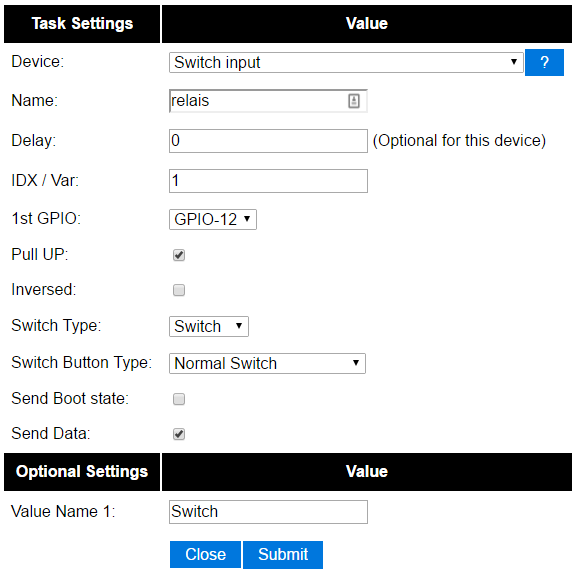 If you want to control your sonoff S20 with ESPEasy firmware using your Android smartphone, go to apkfiles.com and search for and install ESPEasy Switch Controller. It is free and add free. I’m not able at all to flash an Sonoff R(elease)2 via the standard procedure and I failed in doing that via soldering the extra wire. Besides this, I never got a behaviour as you described, so I don’t have a cause nor solution for this. I’m having a similar problem, I believe. Excerpt from the serial console when trying to connect over the wifi. (Access point shows up and I can join). Can you please list the tools and hardware used in your tutorial, so we make sure we have everything right before trying to attempt this ? Any idea how to flash the sonoff r2 ? I did try everything, i cant get it in flash mode. I tried, twice, but failed because you need to solder a wire to a specific little component on the pcb, before you can flash the R2 versions of the Sonoff. 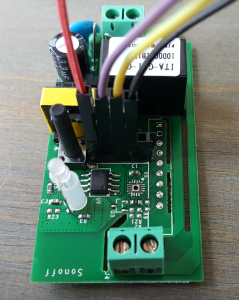 Another cheap and easier solution is explained in a different blogpost of mine: https://www.rutg3r.com/electrodragon-wifi-iot-relay-board-firmware-change-to-espeasy. In the current version R120 of ESPeasy, in order to activate the Rules tab there is one step missing, namely in the Tools Tab go system /Advanced. There you can find the tic box to activate the rules tab. And for the flashing, I faced an issue at first, but after first flashing with a different version and then again doing the same but with the R120 version, I finally got it to work. Although I still do not know why, but now it is working fine. 1. Random results and errors while not using external 3.3V for flashing. Finally I followed this advice ( https://www.letscontrolit.com/wiki/index.php/Basics:_Connecting_and_flashing_the_ESP8266#A_word_about_power_supplies ) and used the cabling guide from https://www.iot-experiments.com/flashing-esp8266-esp01/ to get reproducable results. 2. “Activate led” broke functioning of R120 and R148 for me: ESPEasy seems to work on my device including the activation of the led using rules and the button on the device. But when I activate GPIO13 as wifi led in the ESPEasy setup the device disconnects from wlan. Eventually it reconnects for a few seconds and loses connection again. This repeats again and again in an interval of a minute or two. Resetting the device to factory settings (by shorting RX and TX while powering up) solves the problem and it is possible to configure the device again. Hi Chris, This tuorial is created for older Sonoff versions, but I’ll purchase soon some new ones and I hope it will be done as flawless as the tutorial. nice tutorial! Pls is it possible for one espeasy configured device to control another espeasy configured device? Tnx for the feedback Francis. It should be possible in the “Rules” section of the Espeasy software to set a http call, see: https://www.letscontrolit.com/wiki/index.php/Tutorial_Rules#SendToHTTP. Please let me know if this fit your needs. I personally don’t have a http call setup like this, but will use my HA system to do the other actions. There is no information there… it’s just spam for a webshop. Is it possible to use the pwm feature for the 230v output? So i can connect (dimable led) bulbs to it and dim it with the pwm command? dont work with … “Sonoff Basic” (THv1.1) – 2017-5-5, Ive try every flash program and every .bins on 1st n 2nd n 3rd no way get it working anymore… hmm ?? any suggeust? i check on the chip it “esp8266ex”? I can’t find “..ex” on my chip, nor on the pcb. Check the post of “Pauliussss” on https://github.com/arendst/Sonoff-Tasmota/issues/463#issuecomment-347095617. Maybe it helps in a different way? I have the same issue like “Anthony Straw”, same board version and same (+EX) chipnumber and tried also every flash possibility. A great tutorial helped me a lot. I read also rule tutorial but I cannot do what I want. 4) use Clock but I do not understand how I can I setup date and time without %system% and without ethernet/wifi/internet access. I have several devices, maybe is it possible to reduce then ? Today I write a lot of rule, one for each action, but they are “same”. Is it possible to create 2 functions and call then ? When I use control?cmd=event,switchsonoff or turnOn or turnOff, generally wait 2 sec take effect, and I need be patient 5 sec to do it again. When I press button, it is worst, generally wait 8 sec take effect, and I need be patient 13 sec to do it again. Have I a problem ? If no problem, how can I do to blink led during this time wainting ? When status of relais or button change, how can I return it on html web page ? When I update firmware I loose device, rule and esp.css. I can load esp.css and device, but not rule. Have you an idea ? 1) Your printscreen of “Activate physical button” is the same as in “Basic config”! Respondent Bond Keevil mentioned this earlier. Respondent Adrien reported a nice link showing a second device-task (“Button, GPIO-0, Push Button Active High, State”). 2) I’ve got the physical button “Button#State” working. But the button does not combine nicely with “switchsonoff1”&“TurnOn”&“TurnOff”. I mean; ideal would be that any combination of software-switching or hardware(=button)-switching would take effect. But is doen’t. Even if I try including a “gpio,0,0-or-1” in “switchsonoff1”&“TurnOn”&“TurnOff”. I’m al a loss here. 3) Do you know why “gpio,13,1” turns the led off? I would have expected that “1 means On and 0 means Off” . Btw, it’s nice to include led-on/off in your rules: switchsonoff1, TurnOn and TurnOff. Do you have some other sonoff-rules which you could share? Some improvements are always welcome. 1) I’ve changed the screenshot now. 2) The physical button will only trigger the “on button#state” rule, because those are used on the button device. Just try to get it working with only switching the realis and if this is working well, add the led command to it. 3) The states 0 and 1, we have to deal with it. it’s not as expected, you are right, that 1 should be ON and 0 should be OFF (it’s more logical). That’s how it’s programmed, so we have to deal with it. I don’t use the physical button at all, I just use the TurnOn and TurnOff command from my home automation setup. Even I don’t use the “SwitchSonoff” rule, because In my setup I’m not sure what the actual state is of the device. You can publish ofcourse the state of the Sonoff back to the HA system, well lots of options, but I don’t use it. I think with the correct GPIO number this should be working for the led as well. I’ve checked all my 4 devices, but I don’t use any other rules currently. They all switch just 1 light and that’s it. Very basic and simple. I was curious about the stability of the devices and didn’t expect that such a device was working properly, even without rebooting (for now). My first question: why to switch off the AC power? To answer your question, it an easy solution to turn on the relay during boot. I think you have the wrong image for the instructions on how to configure the push button. For the 3 Sonoffs I’ve currently in use, the physical button on the device itself are working fine and will switch the in/output without issues. Which image version are you using for this now? Do you use the same rules? Do you know if it’s possible to flash the sonoff module with a Teensy++2 ? Sorry, I don’t have any experience with a Teensy++2. I set up the same setup as you but when I press the button on it to toggle the light on or off, when turning off, the sonoff resets. Did you do something to disable the reset function on the button? 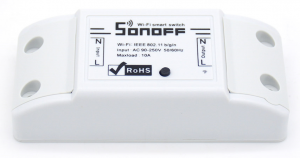 do you have another Sonoff so you can test if your settings are correct? I’ve read something similair and there was (almost) confirmed that the Sonoff was crashing after a certain action (sortof boot loop). Even a complete flash erase didn’t solved it. The user replaced it with a new one and here everything was running fine. Maybe you have bad luck and the device is broken? Dear rutg3r nice how to!! When the flash says ok.
Only there is no esp-0 in the wifi after reboot. Then is there something wrong i think. I try and try every time the some flash say ok. only no wifi. I reset the bord rx and tx jumper for 2 minutes..
Is there a other way to reset the board? Or is there a way to test the board so it is not broken? I’d never issues with SSID visibility, normally it’s just a matter of seconds the SSID become visible after powercycle. Are you using still the FTDI (USB) adapter for powering up the Sonoff? So after the flash just a quick unplug and plugin of USB port into the pc? Even I never powered the Sonoff before configuring SSID on 230V, but it should be possible. I’m not sure which firmware version you have tried, maybe try a different one. v120, v124 or v147 should be the stable ones. Even the Sonoff is running only on 2.4Ghz wifi, maybe that makes sense in the network scan to search for the SSID. – DO NOT USE the esptool.exe/flash.cmd that come with the EASYesp software. Thank you Peter. Yes indeeed, it’s really hard to find such a tutorial. I’ve found them partly on Youtube. I case you have this Sonoff 4ch up and running with esp easy, please let me now. Does this also works with this device from sonoff? I have flashed the sonoff 4ch esp 8285 chip with the esp easy v2.0 mega firmware and it works great! Tnx for notifying!! interesting device btw, maybe I’ll buy one soon too. Nice tutorial… It worked for me.. Thanks a million for a great writeup! Sadly I’m having trouble with the toggle rule but otherwise this was a lifesaver! The toggle rule is working fine for me with several Sonoffs. Actually, I’m using now the “TurnOn” and “TurnOff” commands, which is more accurate. excellent step-by-step guide. This would be great on the ESP Easy Wiki!